Stay in a new hotel with room for diversity. Our hotel is designed with respect for its urban location in the heart of the artistic and gastronomic Kodbyen in Copenhagen. The steaks in MØR restaurant & bar are simply heavenly. Welcome to the new Scandic Kødbyen in Copenhagen. Are you looking for an authentic experience in one of Copenhagen’s most creative and culinary districts? Then this is the place for you. Our hotel is built to suit the environment. With its low-rise buildings and distinctive look, our hotel blends into the rustic background of Kodbyen, which you may already be familiar with or are eager to enjoy. Our hotel is designed to embrace everything and everyone. It offers the pulse, intimacy and space to allow either just a few people or a large crowd to meet in a flexible, inspirational environment. Our hotel cafe, The Coffee Box, is the perfect setting to sit and think outside the box - or to simply enjoy an aromatic cup of coffee and fun conversation in good company. You'll find our restaurant, MØR, inside our hotel. We have enhanced our menu with the finest meat, and our Argentinian grill with open charcoal fire transforms our steaks into an amazing taste sensation. When you're tired after a long day, you'll enjoy a good night's sleep in one of our hotel rooms. The rooms feature cool Nordic decor, designed to make you feel at home and enjoy a good night's sleep. We would also like to recommend our meeting and conference rooms that accommodate everything and everyone who thinks big, differently and outside the box. Our rooms have a capacity of up to 310 people and offer cutting edge technology enables creative thinking, and help generate the energy, power and space for any size conference. 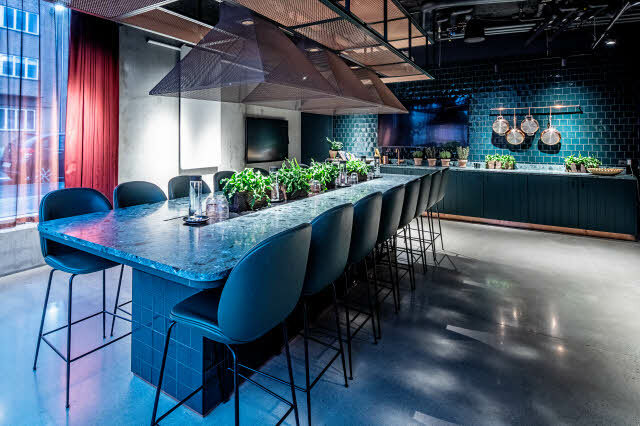 Scandic Kødbyen is located on Vesterbro in Copenhagen - an area filled with history and now a focal point for culture, creativity and culinary adventures. The neighbourhood is characterised by its relaxed atmosphere, trendy coffee shops and small, funky design and craft shops. In the neighbourhood around Kodbyen, you can really feel the city's pulse. You’ll feel the good vibes with plenty of bars, cafes, nightclubs, restaurants, art galleries, multicultural food markets and much more. From our hotel, you step right into this exciting district and can explore all the sights in Kodbyen. And you'll have the rest of Copenhagen right at your feet when you stay with us. From our hotel, it’s not far to concerts at VEGA, Fredagsrock in Tivoli, shopping along Stroget pedestrian street or to Copenhagen central station. Parking has gone underground! If you're arriving to Scandic Kødbyen by car, you can park in our underground car park for a fee. Unfortunately, it is not possible to book parking in advance. At Scandic Kødbyen, you stay in one of Copenhagen's most diverse neighbourhoods with plenty of shopping, charming design and craft shops, great food experiences and tiny temptations. Discover Vesterbro! At Scandic Kødbyen, you can arrange meetings, conferences and events for up to 400 guests. This is the perfect setup if you like to think big, differently and outside the box.